Recent changes to the rules around voluntary superannuation contributions which impact the amount you can transfer into a super pension account, have meant that many older Australians are considering setting up a family trust. Trusts can be an effective way for wealthy individuals to minimise tax, protect assets and transfer wealth between generations. They can also be used together with super for retirement savings. 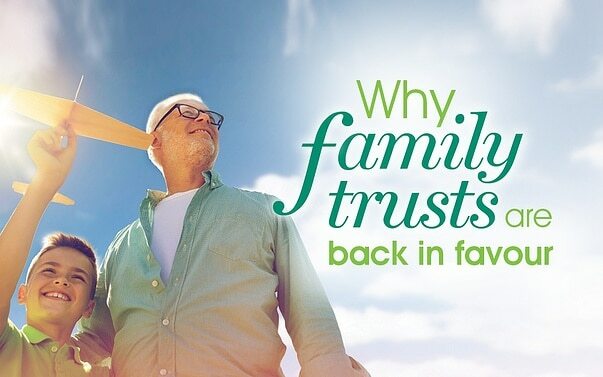 There are a variety of trusts but the most widely used one is a discretionary family trust. A trust, family or otherwise, is essentially a legally recognised relationship where one party (or parties), called the trustee(s), holds assets for the benefit of another party or parties, called the beneficiary or beneficiaries. The upside (and occasional downside) of trusts is that all those involved, control or benefit from a trust’s assets and the resulting income stream while nobody is seen, in a legal sense, to own them. Take the hypothetical example of Charles, a heart surgeon who is in the top marginal tax bracket. He has two twentysomething children, Jessica and Tom. Charles sets up a family trust and puts his $500,000 share portfolio, which generates $36,000 worth of dividend income a year, in it. He names himself and his wife as trustees and his children as beneficiaries. If Charles is sued for malpractice, the disgruntled patient would find it difficult make a claim on the share portfolio given it’s no longer considered an asset of Charles. Should the children be spendthrifts who want to sell off the shares to buy Ferraris, they would be prevented from doing so because it’s the trustees who make the decisions about what happens to the assets in the trust and the income they generate. There are also tax benefits. Rather than giving his children money from his post-tax income to, say, support them while they are studying, Charles can name them equal beneficiaries and distribute $18,000 a year to them. If they have no other income, Jessica and Tom are under the $18,200 tax-free threshold and pay no tax. Trusts also allow a business, farm or other assets to be passed from one generation to another without any immediate tax consequences.i Given our ageing population, it’s not unthinkable that death duties could be reintroduced in Australia. Such a development would likely make trusts even more widely used. In practice, people often find it useful to use a SMSF and family trust in conjunction. Trusts, unlike SMSFs, are not subject to heavy prudential regulation. While an annual tax return does need to be filed, trusts don’t need to be audited every year. Trusts can be used to borrow money, acquire assets and hold lifestyle assets such as holiday homes. While SMSFs are taxed at the concessional super rate of 15 per cent, with careful planning it is possible to reduce the effective tax rate on the income generated by a family trust below 15 per cent. The constant political tinkering with the superannuation rules is unlikely to end with the latest changes, which means family trusts are likely to continue to be a popular asset management vehicle. If you would like to know more about family trusts and whether they may be appropriate for your financial circumstances, please give us a call.